^ 3.0 3.1 Zunt, Dominik. Who did actually invent the word "robot" and what does it mean?. The Karel Čapek website. [2007-09-11]. （原始内容存档于2012-02-04）. ^ Robotics: About the Exhibition. The Tech Museum of Innovation. [2008-09-15]. （原始内容存档于2008-09-13）. ^ Dowling, Kevin. Power Sources for Small Robots (PDF). Carnegie Mellon University. [11 May 2012]. ^ Syntouch LLC: BioTac (R)Biomimetic Tactile Sensor Array. [2009-08-10]. ^ What is a robotic end-effector?. ATI Industrial Automation. 2007 [2007-10-16]. ^ Toy, Tommy. 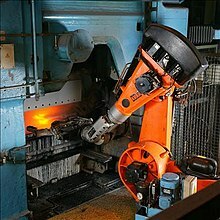 Outlook for robotics and Automation for 2011 and beyond are excellent says expert. PBT Consulting. June 29, 2011 [2012-01-27].